Really Effective way of Increasing Your Adsense Earnings.! Don't get very excited.I got a very effective tool which will help you give a very substantial rise to your income.This cool tool is called as Adsense Sandbox. This tool helps you search for keywords to display ads of specified countries.This means you can know what all ads will be displayed when certain keywords hit your posts/content. Thats not the only thing which is shown.This tool also shows you which ads will be displayed on the specified url.Hmm..now this seems very very useful I suppose. It helps you know what ads are going to get displayed on your website/blog. So scratch your dead nerve cells and think of what I am thinking for making my adsense earnings increase!!!! A new website Enwikopedia gives you a very different type of Encyclopedia, which is surely an anti-wikipedia. A must visit and one more thing which will make you visit it.A 2 GB USB Drive for free. 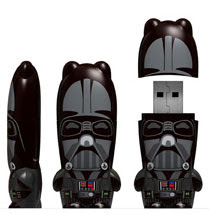 Yes if you have a blog or a website you just have to link Enwikopedia and post your submission here so here you are a chance to win a 2 GB Mini Darth Vader! For more details visit the website and if you want to win make it fast the contest ends 8th September 2007. Life as good as should be.Coke has recently launched Coke zero a website to have real fun with.As you know Coke has its real taste,the recently launched website is something to have fun with and boost within your friends. Now I know everyone has a real dream deep inside ones heart to direct a movie or atleast a part of it.Yes Coke Zero offers you a chance to be a director and direct a wonderful movie clip. Now this is really simple,Coke Zero has some really great b/w videos with which you can play with, yes as a director by adding audio with the simple voice recorder, or even add up a conversation whatever you want .Because you are THE DIRECTOR. Ofcourse make it really sweet but zero sugar as Coke.After your direction is complete you can compete with other directors for the highest rated video all over to tell them you are THE BEST amongst the lot. And always remember Coke zero, a fun drink for people who think Life as it should be with Real Taste,Zero Sugar. Orkut's New Look Coming Soon!! Orkut.com , a Social Networking site owned by Google Inc. is undergoing a process of makeover. The looks seems to be very fresh and really appealing .It seems Google has understood that users have really got bored of the same old look despite some cosmetic changes.The new look will enhance the Orkut feel.The fresh look has a very decent and a very simple color.And has a very new footer and header which makes it look very intact.The friends and communities box will undergo a very contrast look as compared to now, the present view. As per now a very small and random number of users are using this beta version and soon it will be launched to others after some sincere feedback and some good reviews.For further more information you can alternately visit here .orkut Blog: Coming Soon: A New Look!